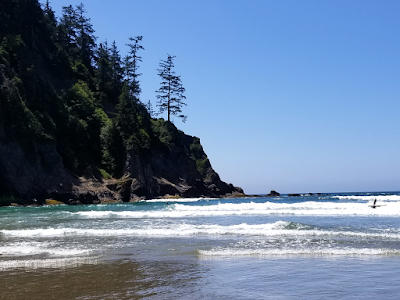 I love the Oregon coast and especially love it in August when the temperatures are often in the 80's! 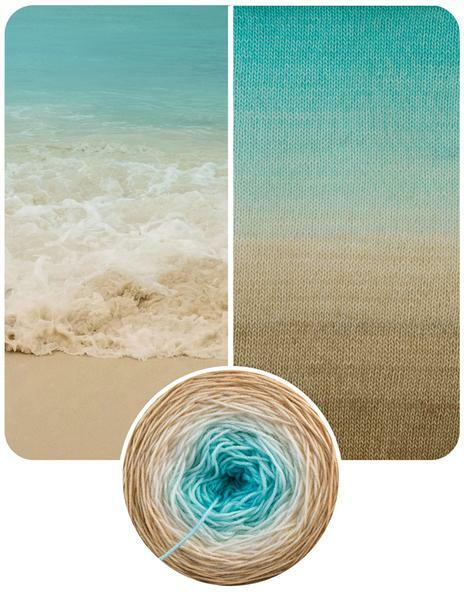 I always have plans to create a beach inspired textile piece, but so far haven't. But that doesn't stop me from looking at what others have done! 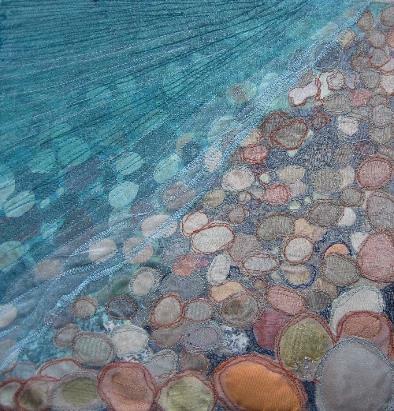 Merle Axelrad works with fabric and fiber collages in a way that is amazing. I love her beach inspired pieces like Central Coast below, but all of her water pieces are wonderful. Be sure to take a look! 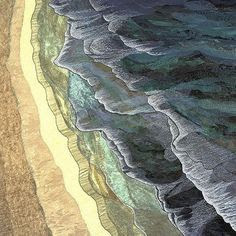 Naomi Renouf also works with layered fabric collages and has quite a few pieces with ocean/beach themes. Sea and Stones, below, is one of my favorites. 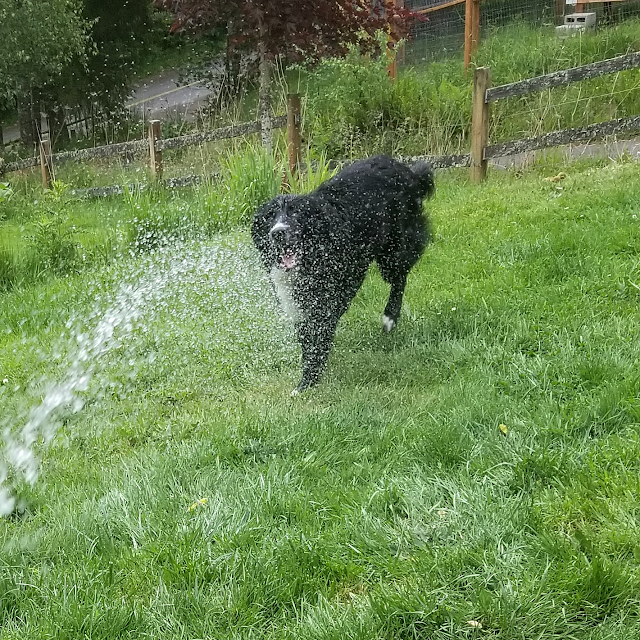 The transparency of the water she achieves is amazing! 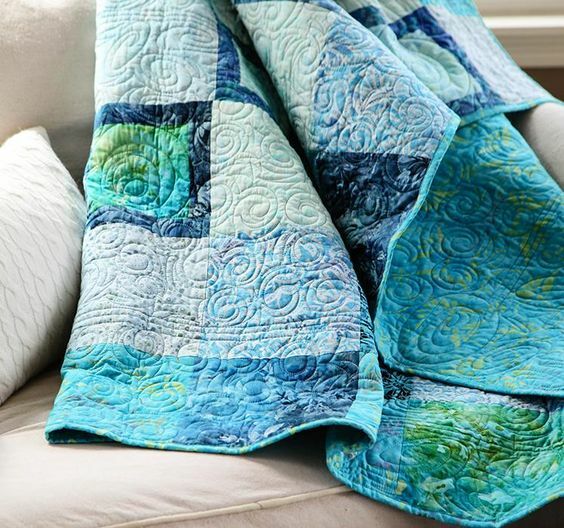 This Seaglass Beach Quilt pattern was on Craftsy but now seems to have vanished from the web! I think I'm going to have to start gathering batiks and see if I can make one just using the photograph. I love how the colors in this make me feel I'm looking at the ocean. If anyone knows who the designer is, please let me know so I can credit them and link to their work. Thanks! And since knitting seems to be what I get the most time to work on lately, I thought I'd see what beach colored yarns are out there. 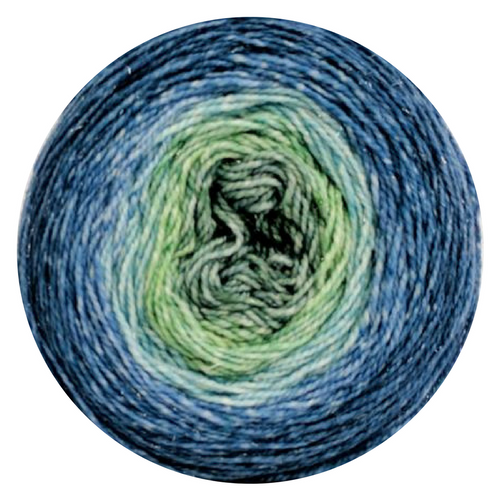 I found two long gradient yarns that I'm trying to decide between for my next shawl! 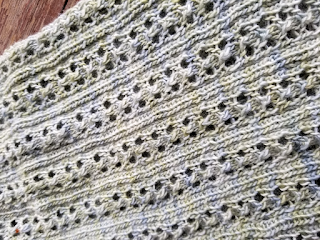 The Blue Brick has Seafoam - I love how all of their yarns are paired with a photograph that inspired the colors and a swatch of how it knits up. And Knitcircus offers Beach Glass - hmmm, a hard choice! It's August already - and I don't think I even need a calendar to tell! 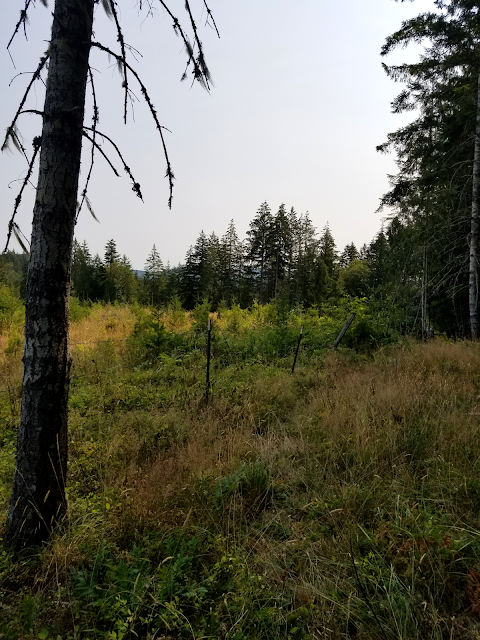 The sunlight in the forest has that golden tint to it and I've been enjoying long walks in its coolness. 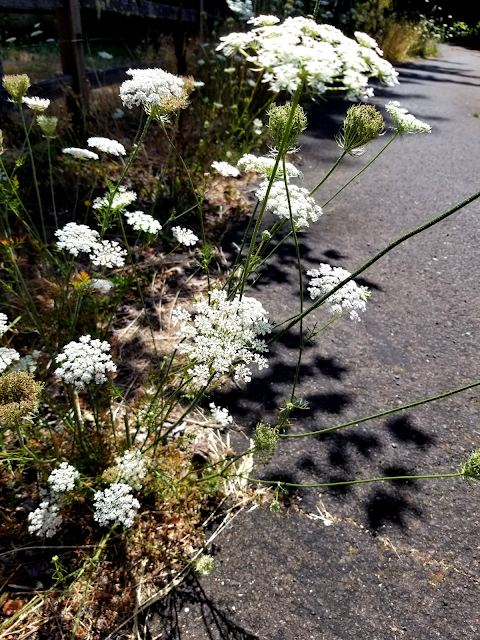 Most of the wildflowers are done and the Queen Anne's Lace is blooming beautifully. 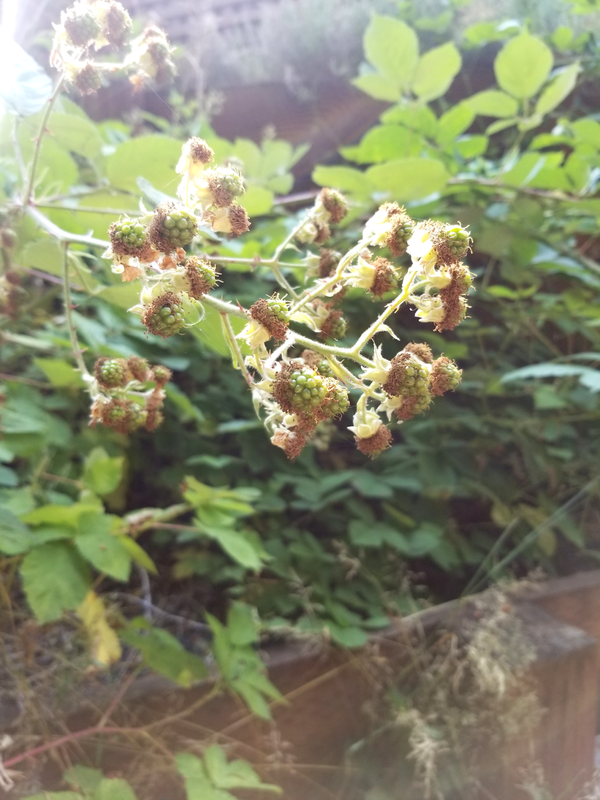 and I'm anxiously waiting for the blackberries to ripen! 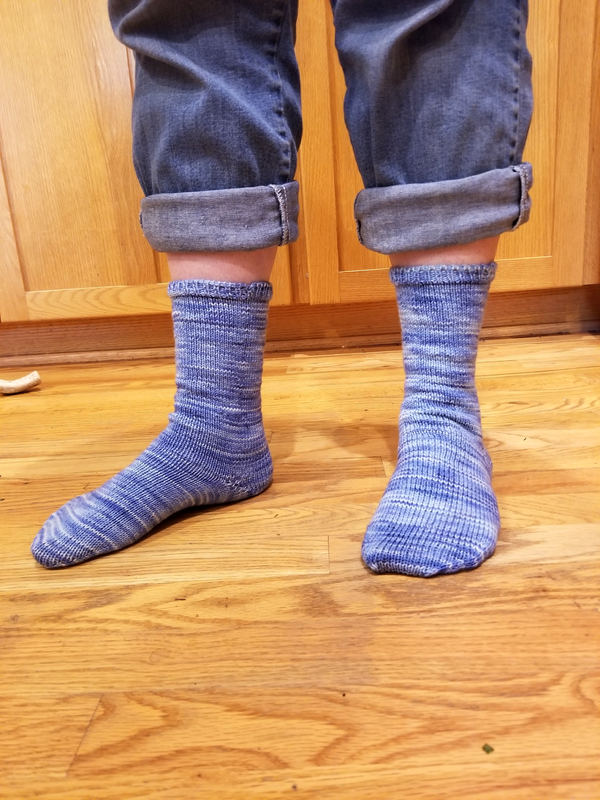 I finished my third pair of socks - a much better fit than the first pair I made for myself! These are from the pattern Simply Beautiful Socks by Fiona Stevenson - they use a German short row heel that I like much better than the heel flap/gusset one, but they did each end up with a gap I needed to sew up. Next I'm trying the Fish Lips Kiss Heel, which is supposed to not have a gap! I'll be in and out this month so probably won't be getting much done but knitting and trying to stay cool! It's hard to believe the second quarter of this year is done already! 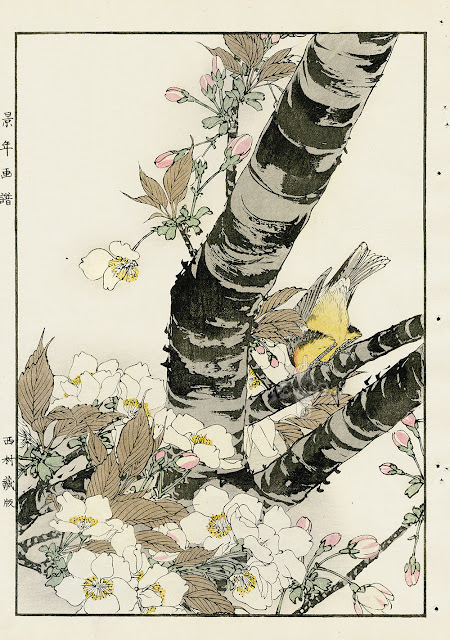 This was the artwork used for the Second Quarter Fiber Art Challenge, a woodblock print by Japanese artist Imao Keinen (1845 - 1924). You can read more about the challenge here. This quarter, I decided to use the colors of the print as inspiration for my work. I found yarn that was very close to the colors of the piece and knit an airy cowl, trying to capture the lightness of the print and of spring. The yarn is Hand Maiden's Casbah Sock in the Peridot colorway. 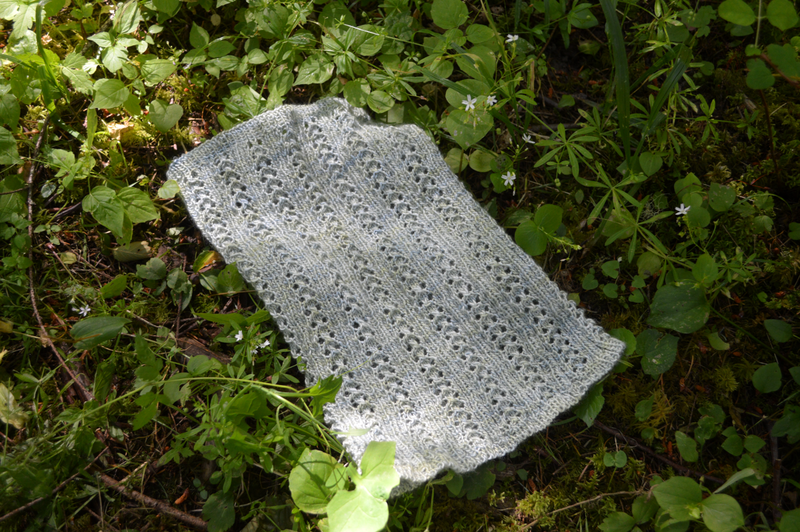 It's perfect for a spring cowl, so soft with the cashmere that makes up part of it. And the pattern is Mora Jewel by Virginia Sattler-Reimer. 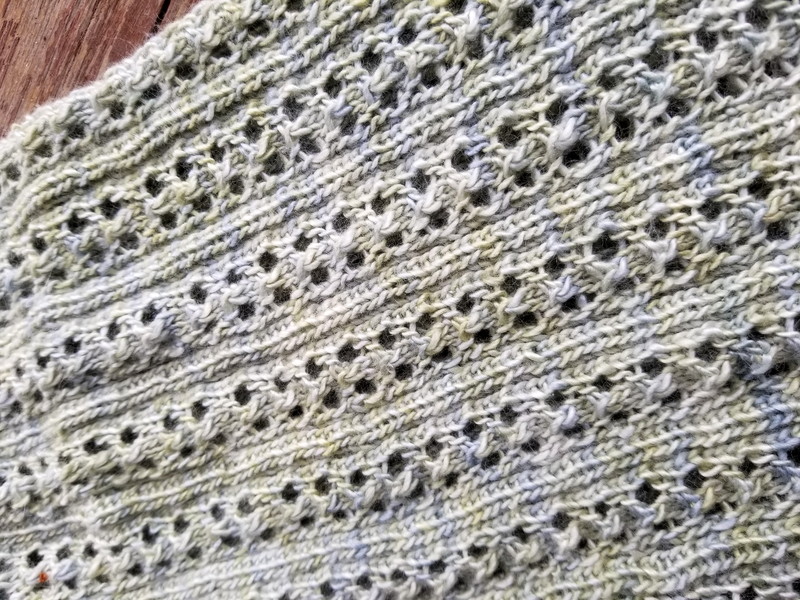 This is a great pattern - it has enough stitch work in it to look nice while still being simple enough to not take all of one's concentration! You can add your piece inspired by the print by clicking below. There will be information to fill out that will link the photo to your blog, facebook post, instagram post, .... some place that you wrote about what you made. If you don't have a spot to link to, contact me and I'll get your photo up on this blog. 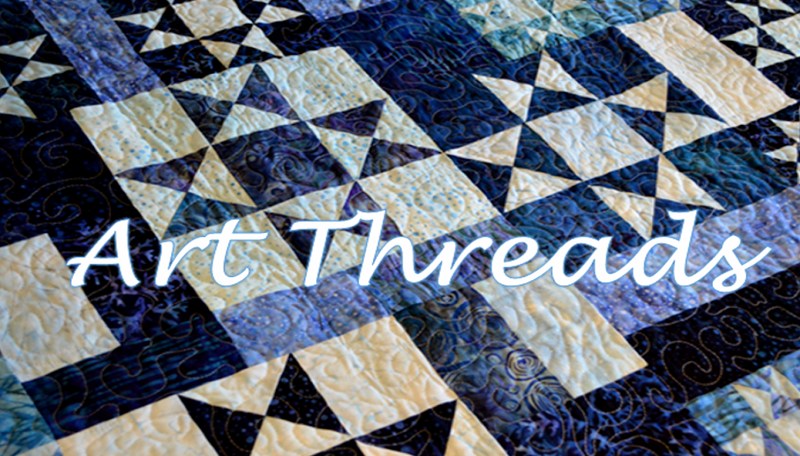 And if you're ready for the Third Quarter Fiber Art Challenge, see this post here. Monday is reveal day for the Second Quarter Fiber Art Challenge! I'm excited to show you what I decided to create and am hopeful I'll be able to see the projects of some readers! If you want to review the Second Quarter Challenge, the post explaining it is here. And if you want to know more about the Fiber Art Challenges, see this post here. And if you want a head start on the Third Quarter Challenge, here it is! I love walking in the woods around our house - I usually get out to them rain or shine every day. 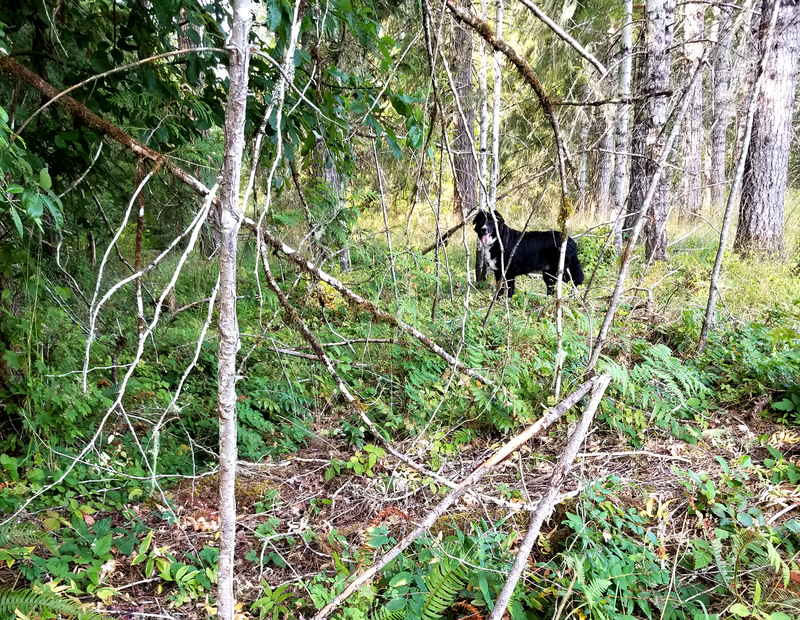 In the winter, the woods are pretty much the same ... a little more mud some days, but unless there's been a snowfall, not too different. Come spring and summer, however, it seems that there's something new leafing out or popping up each day! 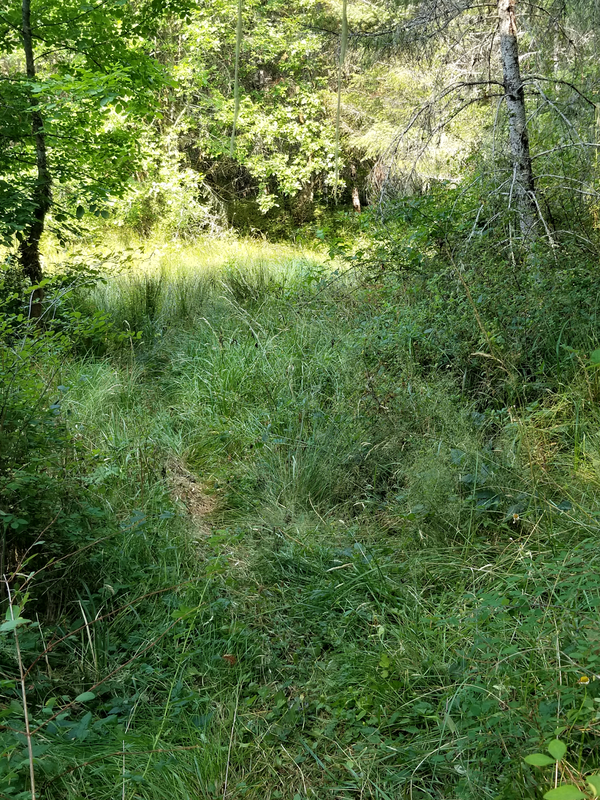 This year has been wonderful for wildflowers and one of my favorites is currently blanketing whole areas. Wild irises come in so many beautiful shades of purple! 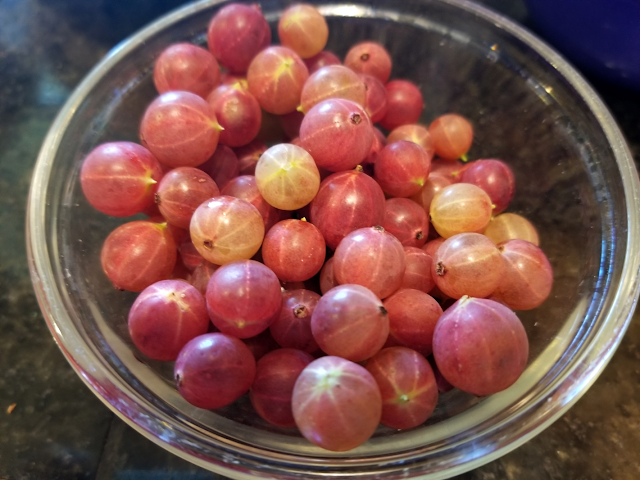 I'd love to have big bouquets of them in the house, but have learned they die shortly after picking, even if they're put in water immediately. So instead I take photos. This quarter's challenge is to create a piece of fiber art that is inspired by the wild irises like the one in the photo above. 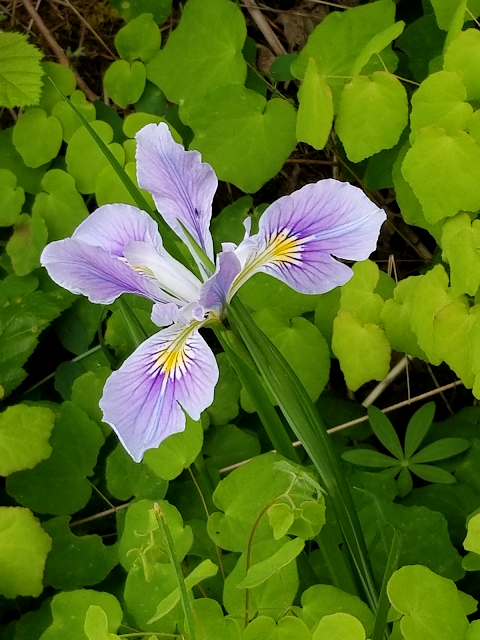 You might be inspired by the flower itself, the colors of the photograph, or something that wild irises remind you of. You'll have July through September to work on your project and then we'll all come back on Monday, October 1st to share our creations via an InLinkz button. I hope you'll join me! 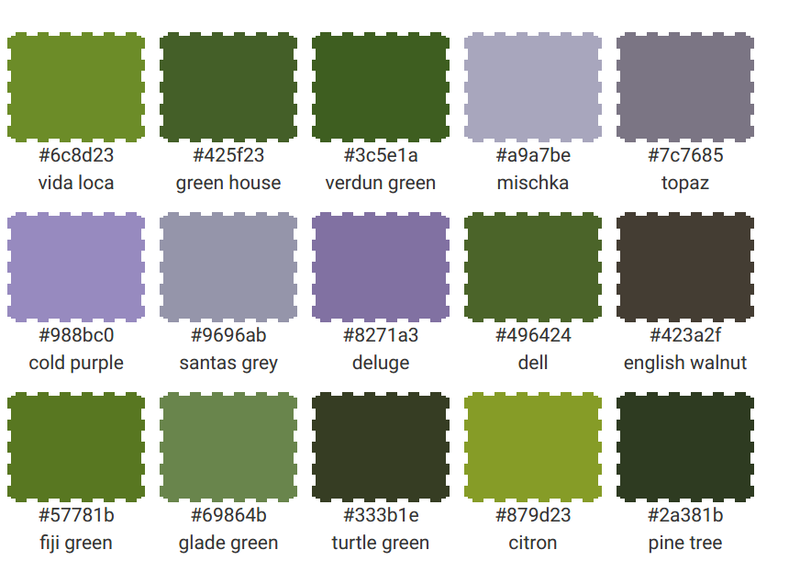 To get you started, here's a color palette I created from the photograph using Big Huge Labs. I am a graduate of Arizona State University (BFA and MA in Art Education), an artist in fibers and ceramics, a wife, mother, grandmother, aunt, and teacher. Original content copyright 2017 by Deborah Schlegel. To get the patterns to print out to size, make sure you do NOT check "print to fit" and if your printer has this setting, make sure you DO check "borderless printing." You should not end up with anything more than a very small (maybe 1/16 inch) border around the page that prints out. If that doesn't work, try printing from Chrome or Firefox - Safari seems to especially have trouble with the patterns!